Sri Sai Baba International Public School is located on the Dehradun Highway, Chidderwala. Ideally located on the main Haridwar Road with perfect proximity to the Queen of the Hills, Mussoorie, on one side, & the Religious Centers of Rishikesh & Haridwar, on the other. Dehradun has always been a favourite with the tourists. Rishikesh & Haridwar lies in the bank of the river ganges. It is also known as meditating centre, that is the reason its also called the yoga city. With tension and stress of daily life's spoiling and effecting our health and mind, yoga enables us to achieve self-realization in a systematic manner and makes us feel relaxed. Sri Sai Baba International School one of the best boarding School for boys in India endeavors to build a truly personalized learning environment for all its student. Listed as one of the best school in Dehradun. It indulges in the all round development of a student�s capabilities. Understanding and applying true value to the fundamentals of education. 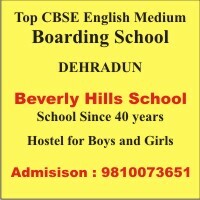 It has achieved a reputation as one of the Best boy�s Boarding Schools in Dehradun.